When I was a wee lass, my family moved to Trinidad. As we were coming through customs at the airport, I was carrying a Sesame Street Spy Book to help pass the time on the flight. For some reason the men at customs believed it was an actual spy book. 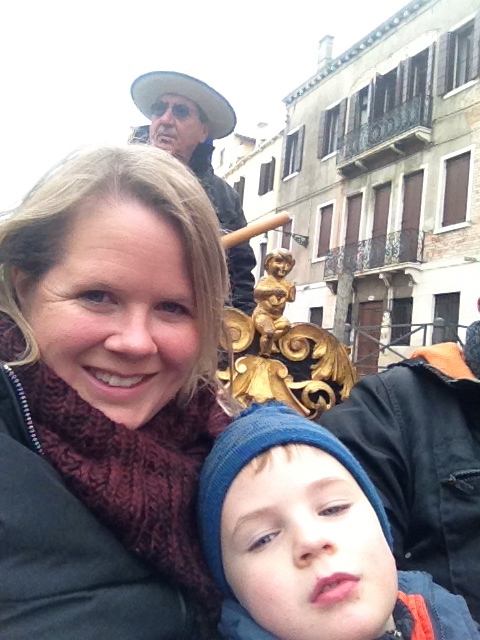 I must have had that look of being an international spy, all at the age of three. They spent quite a bit of time working out the banana codes, while my Dad went off his brain at their stupidity. Finally, after some time, me and the book were let go. Over the years that little tale has been told at many a family function, with chuckles of 'Who'd really think a three-year-old was a spy.' I'm guessing that Robert Rodriguez, writer and director of the Spy Kids franchise, must have listened into this story at some time or perhaps he was behind us in that customs line. Sadly, he hasn't sent me any royalties which I'm obviously owed, but what are you going to do? 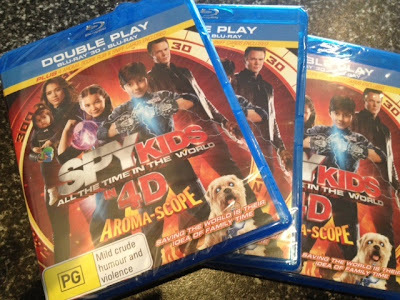 When I returned home from holidays this week, I discovered a parcel with three 3D Blu-Ray copies of Spy Kids: All The Time in World from those kind Roadshow people. Not only is the movie 3D but it comes with special scratch and sniff cards that make the movie a 4D experience. Cool. I can't tell you what the movie is like as I don't have a Blu-Ray player, but I was a fan of the first couple of movies. It also features Ricky Gervais and Jeremy Piven, so bound to provide a few laughs. If you'd like to win one of these babies, please leave me a comment below about a moment in your life that could have made a movie. Entries close Sunday February 5, 2012, 11.59pm (AEST). Open to Aussie residents only. SO much for the relaxed Caribbean attitude they talk about. Maybe they were just bored. My sister was a walking horror movie! Since 'Red Dog' cleaned up at the AFI's I feel that my moment would make a terrific movie. I went to the RSPCA to get a new dog. After looking at virtually every dog they had, I chose an 11 month old bull terrier cross - a girl, but she looked like a boy dog. Once I got her home, she quickly settled herself in - on the couch. Hubby came home from work, she leant over the back of the couch and growled at him. He said something like 'who are you?' and she wondered over to him, all goey. She never growled at him after that, but she went continued to settle herself in - chewing any offending items (like window frames), getting us into the habit of letting her into bed (under the covers) and letting her indulge in her favourite food - sushi.